The fifth and final edition of Beyond Eden will once again be hosted by the Los Angeles Municipal Art Gallery at Barnsdall Park this coming October. Beyond Eden is a multi-gallery event celebrating the New Contemporary art movement in Los Angeles put together by Andrew Hosner (co-owner / curator at Thinkspace) and made possible by the City Of Los Angeles Department of Cultural Affairs. The public is invited to attend this special event and admission will be $5 and open to all. Each successive Beyond Eden event grows larger and larger with combined average attendance well over 5,000 people for the past four years of the event. The New Contemporary Art Movement continues to build momentum on a national level and is finally starting to receive mainstream recognition from major institutions and publications the world over. With its foundation firmly planted in Southern California and a patron base here in Los Angeles that has been building over the past several decades, it’s easy to see why Beyond Eden has been welcomed with such open arms by the Los Angeles arts community and has become an anticipated annual event. It will be sad to see it go but due to rising costs associated with the City, we can simply no longer afford to put this on and have it live up to the standards of our past events. We plan to make this final event one for the history books and one you won’t soon forget. 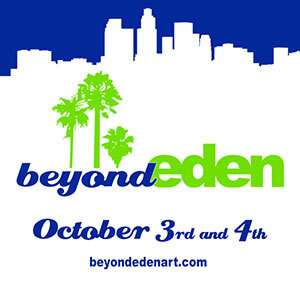 Beyond Eden 2015 will showcase the works of five of California’s finest New Contemporary art galleries and will be held during the weekend of October 3rd and 4th with an opening night celebration planned for Saturday, October 3rd from 6-11PM. Participating galleries include C.A.V.E. Gallery (Venice, CA), Copro Gallery (Santa Monica, CA), Spoke Art (San Francisco, CA), Hashimoto Contempoary (San Francisco, CA) and event organizers Thinkspace (Culver City, CA). In addition to the works on display from the participating galleries, Beyond Eden 2015 will also feature special solo showcases from both Meggs and Mear One. 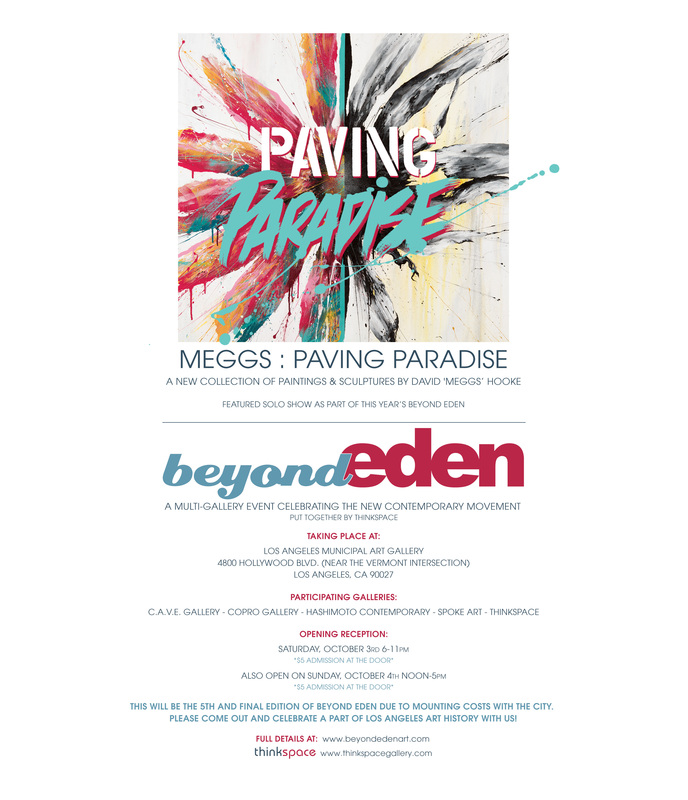 ‘Paving Paradise’ from Meggs will feature an array of new works from the Australian artist along with a large-scale painting / mural for all to enjoy. ‘Cognitive Dissonance’ from Mear One will showcase some of his largest and most iconic paintings to date. Live painting demonstrations on the gallery’s balcony will also be taking place during the opening reception on Saturday night. The Los Angeles Municipal Art Gallery opened in 1971 and is comprised of a 10,000 square foot Gallery and facility located on the sprawling grounds of Olive Hill in the Barnsdall Art Park. The park overlooks the City of Los Angeles and is also home to the famous, historic Frank Lloyd Wright Hollyhock House and Junior Art Center and Barnsdall Park Theatre. Under the Department of Cultural Affairs, LAMAG is the premier city-run gallery that focuses on contemporary art, particularly the work of living Southern California artists.